Olokand includes plans of the underground cave complex Ona-Setrum and a detailed description of the annual Chelebin Tournament of Chivalry. Olokand is the family holding of Clan Elendsa, the royal clan of Kaldor. It is one of two principal seats held by the king, the other being the city of Tashal. 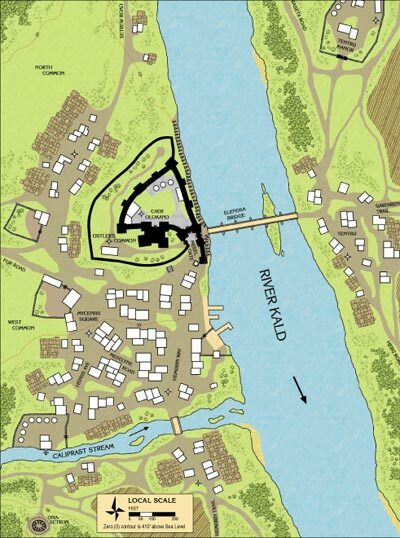 Located on the western bank of the Kald River, Olokand castle guards the Elendsa Bridge and controls the Fur Road, the kingdom's principal trade route with the north. With a year round population over 800, Olokand is one of Kaldor's larger settlements. The population swells in the spring when the Fur Road caravan arrives from Orbaal, and again in summer for the Royal Chelebin Tournament of Chivalry. The king spends four months a year in Olokand, arriving in late Peonu, and returning to Tashal by the end of summer.